I found one, I found one-haha!! You all know I wasn't over impressed with the last black leather jacket I bought-it was only £3, but I still wasn't overkeen. Anyway, that jacket, 2 other jackets and a blouse and skirt were passed to my sister in law who has daughters so I don't know who ended up with what!! Last week, I tracked down the jacket of my dreams-it has chunky zipper pockets and studs on the collar, cuffs and waistband, plus it is a really fitted style and the softest leather too!! I found it at Sue Ryder Care charity shop for £10 and I know it will go with everything and anything in my wardrobe-the search is now over!! What are you searching for that you have yet to find or purchase? Congrats, lady! Isn't it fun to FINALLY land a piece you've been searching for? The jacket looks simply perfect. Well done. Hi Sal-thanks so much my dear-yaay, the hunt is now over, haha!! OK - that's it. I'm flying to the UK to go thrift shopping with you -- that is an AMAZING find. Hi always in style-LOL, wouldn't that be fun, thanks for your lovely comment! a great cardigan in cashmere. super jacket. i like the tailored look. now that jacket is cute! Ahhhhh I had a jacket so similar to that but gave it to charity about 3 years ago...nooo! I've been searching for the perfect leather jacket for almost 2 years now! Hi savvy-thanks my dear! Good luck finding a cosy one! Nice find! Glad you finally found what you have been searching for. I want a pair of black oxfords and some new boots! Nice! And what a great price as usual! The jacket looks lovely on you. Its great you found one you like. I finally found an orange coat that I've been searching for for 2 years. So I don't think I need anything until next month probably. Congratulations! I knew you'd track it down, and it didn't take you long at all! Hi winnie-thanks my dear and good luck with tracking down the oxfords and boots!! Hi wendy-thanks my dear, got there in the end! Hi jess-thanks a lot! It is good when you track something down that you've been after! Hi anny-thanks!! $4 is a definite steal, well done! Hi skye-always lovely, thanks a lot my dear! hi sharon, so glad you found what you've been looking for - isn't it a great feeling?! 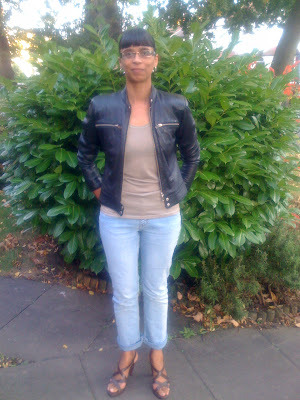 the jacket looks very nice and is certainly very versatile. i always am looking for nice boots and oxford shoes - but these are nigh impossible to find thrifted or second-hand in vienna... however, your luck gives me hope! Hi karima-thanks for your lovely comment.Yes, I agree, footwear is rare to find, I'm a size EUR41 so harder still-but i do keep looking! The perfect shoes. The perfect dress. Sigh. I don't know what I'm looking for but I'll know when I've found it! wow such a great buy!! I really want a leather jacket too..
wow, it's perfect, and so's the price. Snickers. It may seem odd, but I can never find snickers I like. Guess I'm just too picky ^^ I would die for some Oxford shoes as well, but I haven't seen any in Portugal. I've always been searching everywhere for a black leather jacket! I really want a biker one, but can't find one anywhere thats a decent price...cos they all seem to be £80+! well done on your find! Hi ladies who lunch-Surely your soon to be Ossie is the perfect one, LOL!! Hi saray-thanks my dear, hope you find one soon! 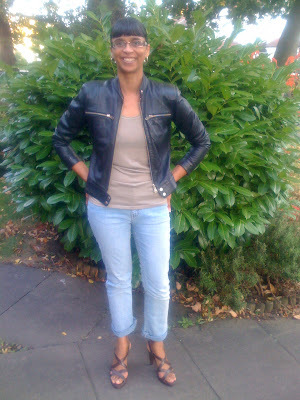 Hi fashion herald and Deb -thanks so much gals, I am really pleased with it! Hi cal-thanks very much-I do hope you find one soon as well! Hi the world is my catwalk-so lovely of you, thanks!! Hi raspberry-thanks for your lovely comment!! LOL, snickers are yummy, I enjoy them too! Hi demi-thanks so much! i know what you mean, a biker style is rare to find thrifted that looks cute too! Woo it does look great on you, and £10 is still a MASSIVE bargain!! I'm still desperately searching the perfect faux-fur jacket for winter, boohoo! I've also found mine leather jacket, but it was a bit more expensive! lucky you!!! Perfect! You look amazing and thats such a good find! Really love the jacket. Looks great on you. Hi Acielle-thanks for your lovely comment my dear! Hi Nic-hope you find one soon and thanks!! Hi atelier-thanks a lot, well done for getting yours too!! Hi Silje-always lovely, thanks my dear! WOW -you look fabulous in that jacket. Very feminin - I like! And the price-lucky you:-)thats almost for free. Well done - I still haven't found mine! Hi Hanne-thanks for stopping by again! thanks for the great comment my dear! Hi kate-keep looking...its out there for you, I'm sure!! Love the classic style, now I want one! Omg... this jacket is awesome and suits you so well! i'm so jealous, sharon! i've been wanting a great leather jacked for so long but can't find one! Hi ladies who lunch-thanks my dear, I love the simple style too, it will go with anything! Hi jaimie-hope you find one soon my dear!! Nice biker jacket Sharon. I would like to get one, but waiting on the right style. I want something with bell sleeve and alot of detail. Hope I find it! Hi budget chic-thanks for your lovely comment, hope you find one soon!